There's so much information out on the web these days, I've realized that convenience is key! And sure, I have been guilty of some of these website faux-pas in the past, so I'm shaming my former self too! But what if I told you that you can fix all of these oversights in just a matter of minutes? The definition of oversight is "an unintentional failure to notice or do something". I'm sure some of these oversights are unintentional and a few could be due to a lack of instructions available on the topic! But some are honestly just due to laziness (it's okay, I won't tell)! In my opinion, this one should be obvious but it drives me CRAZY when it happens! Here I am, happily browsing through your site, I see a link to your Instagram and want to check it out! I click on it... and Instagram opens in the same tab! Say what? Do you really want to steer your site visitors away from your website and hope they remember to click or tap the "Back" arrow? Nope, Instagram is like a squirrel, we take one glimpse and suddenly our memory of what we were just doing is gone! The good news is that most blog and website platforms make it super easy to fix this! In Wordpress, Squarespace, and Weebly, for example, it's just one simple extra step to check the "open link in new tab" or "open link in new window" checkbox when you enter the link! That way, when your visitors click that link, it will open in a new window or tab (depending on which web browser they are using and how they configured that browser). If you're not using a platform that makes it easy to choose a new window for links, you can always get back to basics and insert the code manually (if you feel comfortable with it, that is). Now, I'm not going to turn this post into an HTML tutorial, but if you know enough to be dangerous, you can add a blank target attribute to your links (anchor tags). Also, if you're on Wordpress, you can use this plugin to have all external links open in new windows automatically, so you never have to worry about forgetting to check that box manually each time! One of the first things I look for when reading or skimming a really good blog post or article is the ClickToTweet (CTT) link! It's not always a deal breaker, but I gotta tell ya, I'm 10 times more likely to queue up your post in my social media sharing schedule if you've done just a little extra work for me! Go to ClickToTweet's website to Create A Basic Link and simply enter the message that summarizes what you want Tweeted! Don't forget to include the link and always be sure to give a shout-out back to yourself by including your @username as well! Then just unclick the box to prove you're human and click 'Generate New Link'. BAM, your new CTT link is ready to use and anyone can easily share your pre-written Tweet quickly and accurately! Also since the free version of CTT is not tracked and stats are not recorded for them, if you want statistics for how many clicks you get, create a free Bitly Bitlink for it too (see #3 to find out how!). Take even a little more extra time to design an eye-catching graphic to use for your link! Not only does it fancy up your blog post but making them consistent throughout your site makes them super easy for visitors to recognize. And what better time than the present to insert my own CTT graphic for this very post you're reading! Just click on it to see the power of a ClickToTweet in action... and while you're at it, you might as well share it! I'm sure that by now you must have seen or at least heard about Bitly (and if you haven't, read this handy introduction)! So now that you know about Bitly Bitlinks, why aren't you using them? Most social sharing tools come loaded with their own link shortener (such as Buffer's "buff.ly" or Hootsuite's "owl.ly"), but Bitly's "bit.ly" is by far one of the most popular and comprehensive tools to shorten your links! It's the one I use daily, so I'm going to highlight a few of the top reasons I love it (and why you should start using it... like today!!). First of all, it's FREE! Second, they have a super handy Chrome extension to shorten your links in just one click! PLUS, if you sign up as a user and create your own free account, their interface is not only fun and intuitive, but it's VERY informative! When you use your Bitly account, you're not just taking an obnoxiously long link and making it short and cute, you're also getting free statistics! So you will know not only how many times your links are clicked but also where your traffic and referrals are coming from! This fix easily takes less than 5 minutes! Just bookmark the Bitly website or install the Chrome extension so you've always got quick and easy access! Then, the next time you want to include a link on your blog, on social media, or even in an email, create a convenient shortened link that actually serves a purpose! Register your own custom short domain and create your own custom short links! I started doing this several months ago and I really love the unique touch it gives my social media feeds! They go to the same page but they are branded with a shortened version of my domain (it's kind of like a vanity license plate for your links)! I learned this handy little trick from the wonderfully creative Kory Woodard and you can see her full post and get all of the instructions here. Have you noticed that your Pinterest Pins don't stand out or provide as much detail as others you've seen? A regular Pin almost looks incomplete compared to its newer, bigger, and better big sister, the Rich Pin! For the sake of this post, I'm going to focus on the Article Rich Pins, but there are actually 6 different types available now! Rich Pins work by displaying metadata from marked up pages on your website. If you're on Squarespace, all posts and products have Rich Pins enabled by default (so you can do a happy dance and skip to the instructions on getting validated!). If you're on Wordpress, the most common and easiest way to setup Rich Pins is with the Yoast SEO plugin. Pinterest master extraordinaire Melyssa Griffin has put together a thorough post on how to install and set it up that you can find here. If you're on another platform, Pinterest has put together a complete guide to 'Getting Started' that includes how to manually add the required metadata to your site. Once you've gotten over the metadata hurdle, the next steps are to verify your Rich Pins before they'll appear on Pinterest. To validate and apply for Rich Pins, go to the Rich Pins Validator page on Pinterest's site and follow their instructions! After your Rich Pins are approved, any content on your site with metadata will turn into a Rich Pin when a user saves it, there's no need to submit every page after you get your approval. Now that you've gone through all that work, I just know that you want to make your new Rich Pins stand out, right? Well, the super savvy and talented Lindsey Hazel of Hazel Haven has put together an amazing post with the 3 things that will help you create a Pinnable Pin! She's rounded up tips on creating an easy to read title, including a call to action, and most importantly a step-by-step video tutorial on using Canva to create a dazzling graphic! You can find it all here! Most Wordpress, Squarespace, and other popular blogging platforms typically build in the right code by default so the summary cards work on autopilot. To be sure how yours will look, the first thing you can do to run a test is to use the Twitter Card Validator. Not only am I sure to test my own content with this tool, but sometimes I check the links of others that I'm posting too, just so I know how they will show up in my feed! Now the errors could include a variety of issues, anything from invalid meta tag property to your page being denied by robots. But regardless of the reason, it will be very clear whether your summary cards are working or not. If there are errors, you will see "Unable to render Card preview" in the preview box and there will be red errors indicated in the log. If you are whitelisted, it will be highlighted in green under your URL, the preview will show up beautifully in the preview box, and the log feedback will all be green! If you've found that your blog isn't handling this for you or you're using a platform that just doesn't support this feature, there's still hope! Regardless of why, you can still make the preview summary cards visible with just a little bit of code! 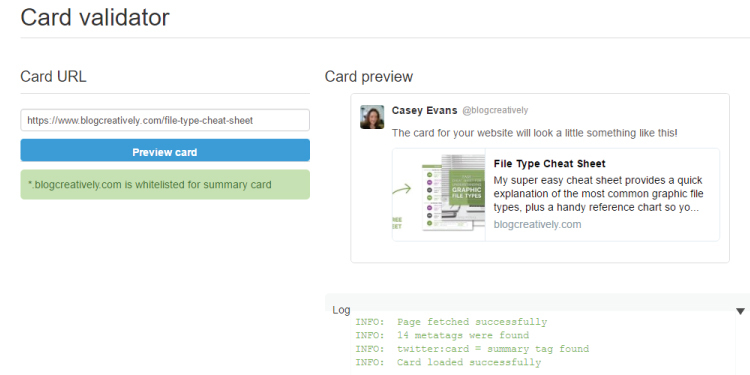 Consult with Twitter's Developer Documentation to find easy sample code and instructions for both the Summary Card and the Summary Card with Large Image. All you have to do is replace their sample content with your own site content then insert the custom code on the appropriate page of your site! If you made it this far, you're a rockstar! Please take a moment to share with me what your biggest take-away was from this post! Also, I'm considering doing future in-depth posts to break down some (or all) of these oversights into thorough, step-by-step instructions. If there's one you really would love to see go all the way through the process from A to Z, please vote for it by leaving a comment below! And of course if there's any other questions you have about this post or anything else I could help you out with, please don't hesitate to contact me anytime!